Record Shots seem out of vogue in many competitions these days so let's give them a chance to shine here. We must all have taken them from ancient castles to modern skyscrapers and every thing in between, both external and internal views. Show me your best. The usual weekly rules apply, shot for the competition or from your archives, and taken using a Pentax camera or clone thereof. Competition closes midnight on Sunday 1st July 2018. The Blade Beyond The Ruins - GlynM. The juxtaposition of the old with the new works well and was well seen. However the Abbey walls dominate the image and take attention away from ‘The Blade’. A crop to a vertical letter box format would reduce the walls and produce a better balanced image. John Rylands Library - johnriley. A great viewpoint to shoot the reading room and the non symmetrical composition has allowed detail to be picked out down the left hand side. The highlights have been well handled but there is a loss of detail in the shadows. A case for HDR in these conditions? National Football Museum Manchester - timcx500e. The mono conversion and the symmetrical composition allow the curves and leading lines of the structure to produce a very strong image. Unfortunately the lettering (which you could do nothing about) is very distracting, complicates the picture and reduces the impact of the framework. Scott Monument – perspicador. Another image which would benefit from a vertical letter box crop to reduce the impact of the dominant trees down the right. Chillingham Castle – tyronet2000. The castle has been well photographed, sharp throughout, lots of detail in the buildings. What makes the picture, however, is the treatment it has been given which captures the impression of a really ‘spooky’ place. Locally Iconic – Aitch53. This to me is a picture of two halves: the Town Hall and the Monument. I would have concentrated on one or the other. Each of which would have made an interesting shot. St. Roch’s Windmill – wozfromcov. The stitched panorama has worked well to get all the windmill in the picture has resulted in lots of detail in the building. However the large white area to the bottom left corner has killed the image stone dead and it could so easily have been cropped out. Wells Cathedral – davidtrout. Great view point, beautifully balanced light, sharp from front to back and packed with fascinating detail. What more could you want. A fabulous shot. I love it. BMW World. – pipinmels. From the 12th century to some futuristic city somewhere in space. What a contrast in two images. The HDR has worked well keeping detail throughout in both the highlights and the shadows.. I like the composition with the walkway leading you through the picture. I would have c ropped the image slightly on the LHS to remove the triangle in the top left corner and also the RHS to remove the small highlight on the edge. Trinity College, Cambridge – NigelK. The pathway provides leading lines to the build but unfortunately there is very little else of interest in the bottom half of the image. A crop just below the circular building on the right would concentrate attention on the building. The lights on the doors and windows on the LHS need darkening to match those on the right. Another case for HDR?. The William and Mary Wing at Hampton Court Palace – Abe_Normal. A very similar image to the previous one. However in this case there is lots of detail in the foreground. This and the symmetrical composition work well. Add the balanced lighting across the image and the result is a very competent piece of work. Two for the price of one – ken2390. I can see at least five for the price of one and therein lies the problem, too much information. A longer lens would enable concentration on an individual subject, a wider angle to capture the London skyline. As it stands it is betwixt and between. No political pun intended but Parliament is leaning a little to the left. King Edward Hotel – Noelcmn. A good shot of an old Colonial building. Could the verticals have been straightened? Does it need all the foreground?. Selfridges and Footbridge, Birmingham, UK – Simonmac. Again old and new come out next to each other. The mono treatment has allowed interest to concentrate on the shapes within the image and has been well handled. The lamps in the background break the clean lines of the image and could be cloned out. 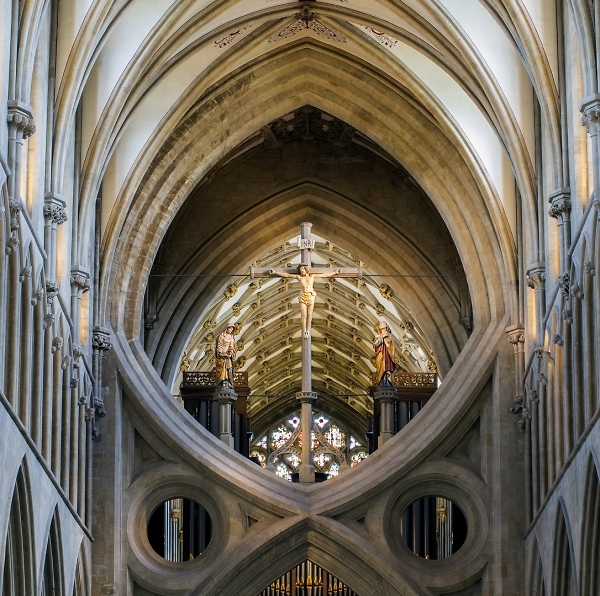 1st Wells Cathedral – davidtrout. I just loved this image, simply the best. 2nd.The William & Mary Wing at Hampton Court Palace – Abe_Normal. A well crafted imaged which fitted thr brief. 3rd Chillingham Castle – tyronet2000. I liked this image because the treatment produced a very ghostly feel to the Castle. Congratulations to the Winner and other placings. Thanks to noelm for the interesting subject the judging and the comprehensive comments. Thanks also for nominating me to 3rd place. Couldn't have been an easy competition to judge although I thought Davids entry was a sure Winner. Thank you so much Noel for awarding me top spot among so many quality images, and also for your detailed comments. My congratulations to the runners up, Abe Normal and Stan and to Simon, John and pipinmels for their excellent HCs. My choice of subject for this week will be posted later today. Many thanks Noel for an excellent and well managed competition that attracted a great number of high quality images. Congratulations to David for the beautiful winning image, the runners up and everyone else for another set of fantastic images. Stunning winning image, makes me want to add it to my bucket list! Congrats Davidtrout, beautifully composed with excellent details to explore there. And extended to Abe_Normal and Tyronett2000, and the HC's Simonmac, johnriley,pipinmels. Loved this challenge, architecture is always a favorite with photographers, all to evident in this challenge. Thanks Noel, for the challenge and the Comments and Critiques. And to answer you question- it is a very wide building, and I wanted to include some contextual elements. Besides, I would have had to stand in the middle of the road, not a healthy exercise. Great competition Noel. Thank you. Well done to the winner and places and cheers for my HC.